We met Gary when we were picking up our residency visas at our lawyer's office in Quito. He walked in, a clean-cut fellow, and didn't exchange any greetings with us. Exchanging greetings is the normal thing to do here. Marilyn was at the desk talking to an assistant. I was thinking about trying to start a conversation when Isabel, who had come with us, punched me in the arm and winked at me as if to say, "This guy is definitely a foreigner." Marilyn finished at the same moment and asked the guy where he was from. "Oh? My husband went to Champaign-Urbana to get his Masters Degree." Notice the placement of Urbana and Champaign relative to each other in the conversation. The two cities ("twin cities") are adjacent to one another, with the University of Illinois campus spanning both. My mailing address was Champaign, so I refer to the twin cities as Champaign-Urbana. Gary lived in Urbana, so he refers to them as Urbana-Champaign. It's a rivalry. Urbana has the edge, however, as the university's official address is in that town. We then had a nice conversation and exchanged email addresses. He retired two months ago and plans to settle in the south of Ecuador because of the low cost of living, but needed to hang out in Quito while his visa was approved. 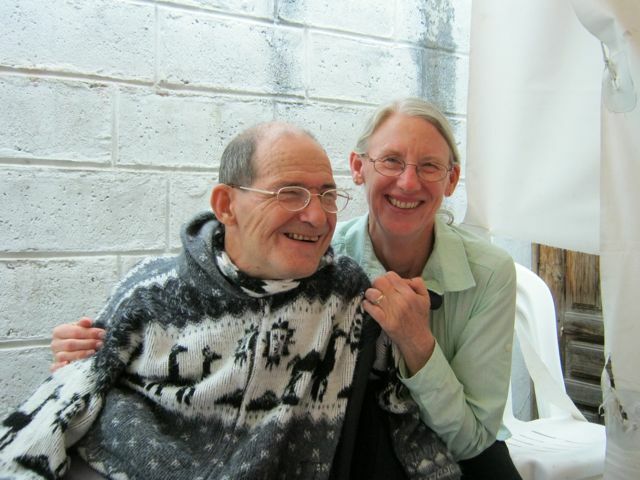 Marilyn and I invited him to visit us in Otavalo for two or three nights while he was waiting. He took us up on the invitation. Gary arrived in Otavalo around 11:00 am. As arranged, he called Marilyn to come and get him. After lunch, Marilyn, Gary, Brayan, and I took a walking tour of Otavalo. Of course, we took Gary to Plaza de Ponchos. He found something for his mother. Brayan also saw a bufanda (scarf) embroidered with his favorite team and we loosened up a bit and got that for him. Ever since we've lived with Brayan, who is now ten years old, we've been careful not to give the impression that he could have whatever he asked for. A bufanda seemed like a wise time to say yes. We decided to keep walking south so we could get pan (bread) at our favorite panaderia. We passed by a museum I had long wondered about. I noticed it was open and encouraged the rest to go in. It was really interesting. 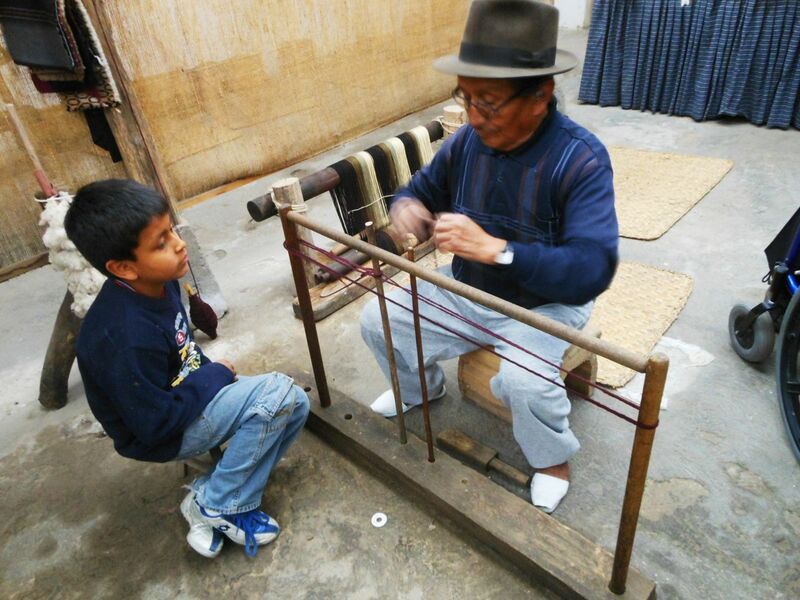 The owner explained and demonstrated how Otavaleños made their famous textiles, both before and after the Spanish arrived. He used many of the machines and tools that were on display in the museum. 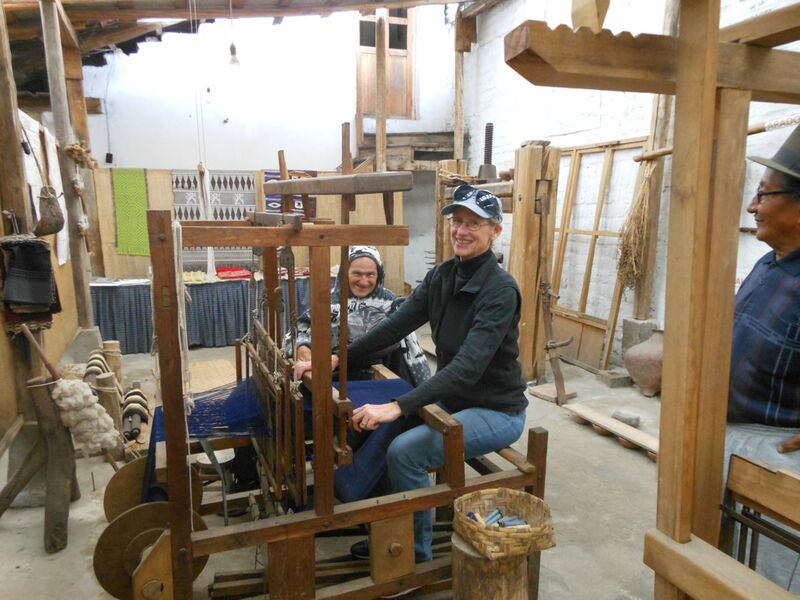 I was particularly enthralled with the spinning process. The way one can take a wad of alpaca, or wool, or cotton and draw it out into a strong strand just fascinated me. The looms the Spanish brought were invented in the Arab culture. A cute thing was that, at the end, this 76-year-old man spent about five minutes bragging on two of his sons, one of whom is a university professor in California and the other of whom is an Ecuadorian minister. It had nothing to do with the museum. It had no segué. He was just very proud of his sons. Marilyn, Gary, Brayan, and I went to San Antonio de Ibarra because Gary was interested in seeing the carved wood pieces. We walked around for about two hours (more than normal) and saw some really nice stuff. I told Marilyn that I enjoy it more each time I go. At first, I thought it was all religious art, but now I'm seeing a lot of other nice things, too. Religious art is fine with me, just a little boring when it's the only theme. Rather than waiting until we got to Lago Cuicocha, we had a picnic in the square. Gary was pretty impressed when he saw Marilyn pull out our collapsible cooler and quickly put together our lunch. Marilyn's mom gave her that cooler years ago. No one at the time had any idea that it would be used in Ecuador. For some reason, we didn't have to pay an entrance fee at Lago Cuicocha this time. After telling the smiling attendant where we were from, he just waved us all through. The first thing on the agenda was to take the boat ride. I waited in the car while the other three enjoyed it. They also got some canelazzo, a drink that can be made with or without alcohol. Gary said the boat ride was worth way more than the $2.50. That could have been the wine in his canelazzo talking. I doubt it, though. Lago Cuicocha is a beautiful lake, similar to Crater Lake in Oregon. About noon, Gary and Marilyn walked to Cascada de Peguche. Gary got the feeling that it was a holy place, which it is for indigenous peoples. Gary took us out for lunch before going back to Quito. We went to Fritadas Amazonas so he could experience some more of the local fare. He enjoyed it, just like we do. In fact, he seemed to enjoy everything while he was here. He's pretty open to new experiences. But he told us the thing he enjoyed most here was sitting around the table and talking with the family. I think most people who visit us enjoy that. After lunch, we took him to the bus station and he caught a bus to Quito. He wanted to also take Isabel, Victoria, and Brayan out to eat but they had gone to the visitation for Victoria's sister in Quito, who had died last night. Victoria is now the last of six siblings and is very sad. Gary says that he'd like to come back to Otavalo and shop for gifts before his Christmas visit to the United States. We'll see. Marilyn and I have been to Cuenca once and know that there are many beautiful things to buy there, also. Whatever he does, we all plan to stay in touch with one another. I'm sure there are more than two people with ties to the University of Illinois in Ecuador (President Rafael Correa is one, I understand.) But, come on. What are the odds of meeting in a Quito law office when one lives in Otavalo (two hours north of Quito) and the other is on his way to Cuenca (about eight hours south of Quito)? The answer, of course, is higher than we may think! Thanks for the update. I love your blog. I miss you all and wish I could see you. We happened to come across your blog with the name Gary Vail. It drew our attention and we enjoyed the entire entry. This all came as a surprise, because I am Gary's 88 year old mother. I remember Gary telling of the unusual meeting with someone that had been to the University of Illinois, however it was much more meaningful reading the occasion from your perspective. Thank You for your hospitality to my son! Your welcome, Mrs. Vail. We enjoyed showing him around Otavalo. ¡Finalmente! We got our residency visas today. We've only been trying for more than a year and a half. That's sarcasm, folks. It's supposed to take about three months to get a pensioner's visa, which is what we got because we're both receiving Social Security. What this means is that we no longer have to hope we can get another visa (and pay the fees) every six to twelve months. Residency visas are stamped with the date indefinitivo. We can stay in Ecuador for 20-30 years, or choose to go back to the United States tomorrow. When we began trying to get the visas in early 2011, the Department of Immigration was in turmoil. The jefe (boss) had been dismissed for corruption. The department was changing all of its rules. Blanca, our great friend, was helping us. They told us (through Blanca) that it would be best to get a business visa of some kind for six months, until things in the Department of Immigration got back to normal because this visa wouldn't require as much paperwork. If there's anything Latin American governments love, its paperwork. The United States government would come in dead last in a paperwork competition with Latin American countries. Meantime, we made sure to get all the documents we needed from the United States. Among other things, we needed birth certificates, our marriage certificate, and a police report for each of us. I have heard of a guy who actually robbed a bank in a wheelchair, so a police report on me is not as far-fetched as it might seem. (By the way, the Robber in the Wheelchair didn't get very far. I guess his plan omitted a get-away car.) By the time we tried again for our residency visas, we had our documents ready, or thought we had. The Department of Immigration was still changing bosses and procedures. A new head of the department would come in, change the rules, and be gone in two or three months. The next guy would change the rules to his liking. It was a mess. Thinking that this was beyond Blanca, and that she should not have to take whole days away from work to help us, we decided to go to a lawyer. 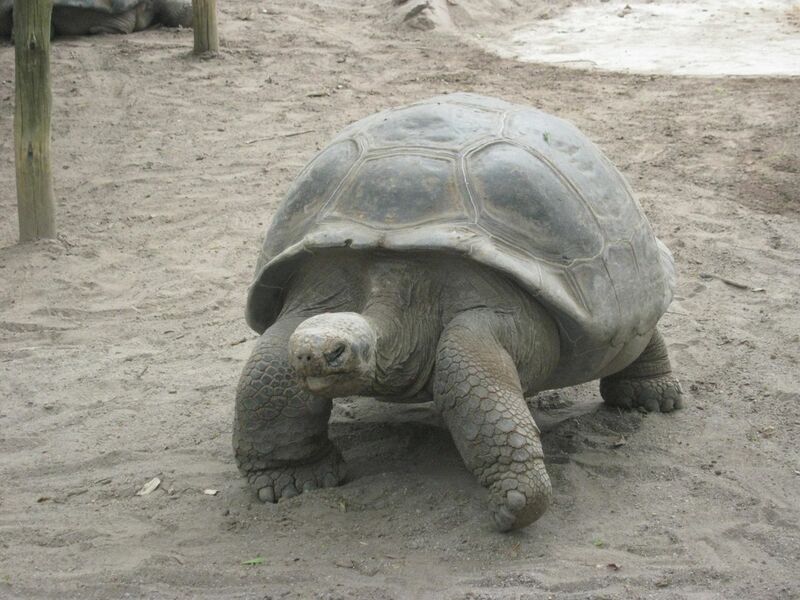 I belong to an Ecuador Expats Yahoo group, so I solicited recommendations from that. We found an English-speaking immigration lawyer in Quito and decided to go with her. It turned out that she had as much trouble with the constantly changing rules as Blanca. In July, 2011, we were again told that it would be simpler to get a non-residency visa until things settled down. Our lawyer helped us get twelve-month missionary visas, the same kind we had when we first came to Ecuador. Back to square one. Instead of waiting until June or July to begin the process again, we went to the lawyer in January, 2012. We figured we'd surely get the visas in six months. The Department of Immigration was working again. Our lawyer said it would take three months or less. Ha! Things continued to change. "I need this document." "Now, I need that document." Many of my emails were not returned. It crept toward June, then July. There came a day, July 14, 2012, when we became illegal aliens in Ecuador. Our lawyer said not to worry because our applications were "in the system". (I couldn't help but think of the song, "Don't Worry, Be Happy!") Yeah, right. I worried. I worried every time we were driving and saw the police checking cars. I was sure they'd check our expired cedulas (identification cards) and give us the boot. Surprisingly, to me, Marilyn wasn't worried. She had been told that many people live here illegally and never get deported. However, after we had our residency visas, I ran across a post in Ecuador Expats - "My Wife Was Deported". I showed it to her and she began to understand why I had been nervous. All's well that ends well, right? Well, not exactly. Now we need to get permanent cedulas. These require our marriage certificate and birth certificates. Having just completed the process for residency visas, you'd think they'd know that these documents had already been submitted and are "in the system". But, then, you probably think logically. They want new documents. At least, we're not illegal anymore. Sometimes our lives are touched by extraordinary people. At times, circumstances contribute much to making a person extraordinary. At other times, the person inherently possesses "extraordinariness". Whatever the reason, Isabelle is very impressive - and she's only eighteen years old! Marilyn went to pick up Isabelle, a short-term intern for FEDICE from Germany, at 2:00 pm in the afternoon. (We pronounced her name Isabella to avoid confusion with our own Isabel.) She had been staying with Sebastian and his family since Monday. Sebastian was the president of the board of FEDICE and lived in Tocagón, a community nearby. Sebastian and other people had been showing her how the community functioned, what their plans were, and what their problems were. She was scheduled to stay with us until Sunday morning and we'd been assigned to show her the more touristic sights around Otavalo. We're pretty good tour guides, so we thought we could handle it. In fact, not long after they arrived, Marilyn took Isabelle and Brayan walking to Cascada de Peguche. Another thing we got to do was have her experience our "blended" family. Isabelle spoke German (of course), English, Spanish, and some French. I was sure Italian wouldn't be much of a stretch for her, either. At merienda (dinner), I asked Isabelle why she came to Ecuador. She said that she finished high school this year and was wondering what to do before starting university in the fall. 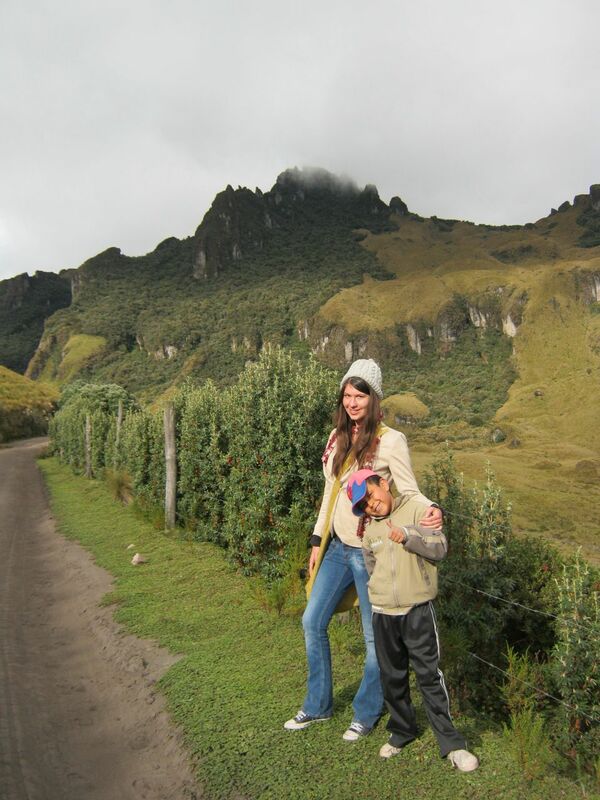 Her parents had come to Ecuador in 2010 on vacation and fallen in love with the country. Her dad especially encouraged her to come here and get to know the people. She said she had a choice - party with her friends all summer or travel to Ecuador. She chose to travel to Ecuador and get to know another culture better. You can't get much more mature than that. At 18, I had drive, but certainly not that kind of maturity. It blew me away. She came to Ecuador attached to a volunteer network in Germany that sends volunteers all over the world. One of the places is Quito. 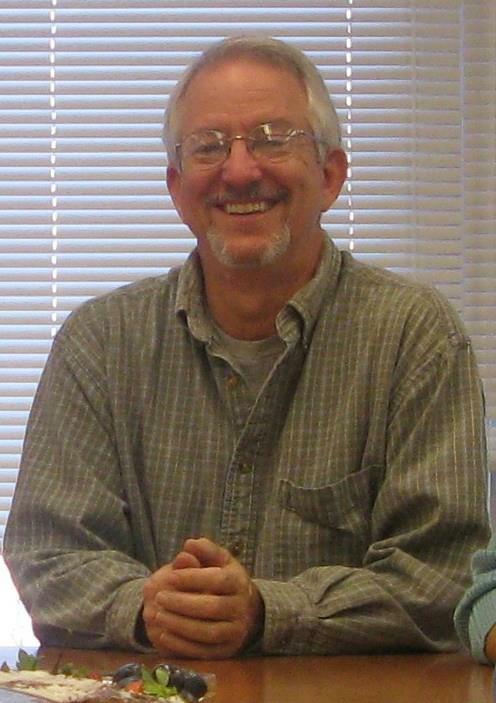 A relative of Victor, the Executive Director of FEDICE, works at the university in Quito with which her organization was connected. A friend of that organization told him that Isabelle was interested in volunteer work and he managed to connect her with FEDICE. 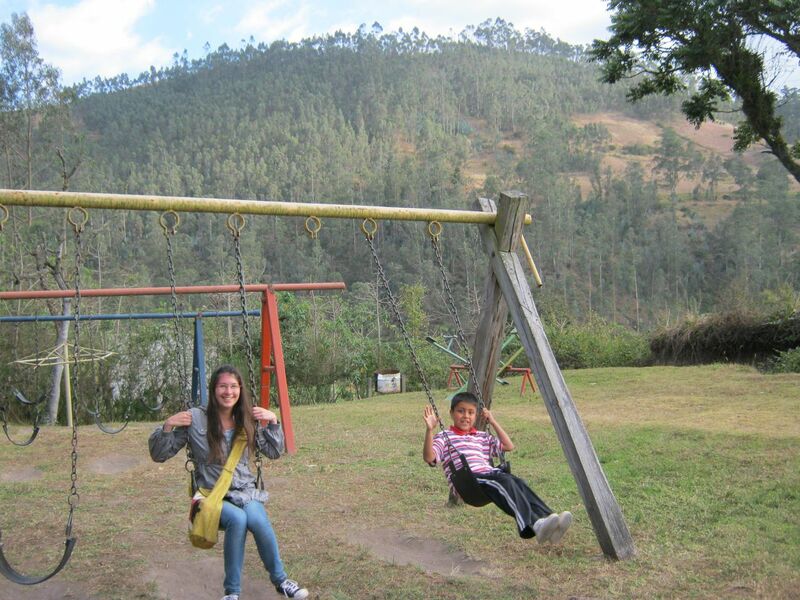 Last week she worked in the office and visited some of FEDICE's projects south of Quito. Her first night with us, Isabelle stayed up until between 10:00 and 11:00 pm catching up on email and Facebook. I don't think she had had much access to the Internet for a few days. She even fell asleep at the computer before going to bed. I, on the other hand, stayed up until about 1:00 am working on the FEDICE website. Not even a guest could change my late night habits. Marilyn and I walked downtown with Isabelle to show her two of the fruit markets and two churches. We stopped at Punto y Coma to say hello to Luz and Maria Augusta, her daughter. Luz and Cesar, Isabel's brother, operate the Punto y Coma restaurant. Isabelle got to meet Luz and all her employees, including Christian, a handsome 19-year-old. Remember Christian for later. El Jordan, the first church we wanted to show Isabelle, was closed, but she enjoyed walking through the Copacabana fruit market to get there. We also stopped at a store where Isabelle could buy some postcards. After we walked through the second fruit market, which was being remodeled, we walked through Parque Bolivar and went to the main cathedral in town. They have some new paintings that I hadn't seen before and it was enjoyable. 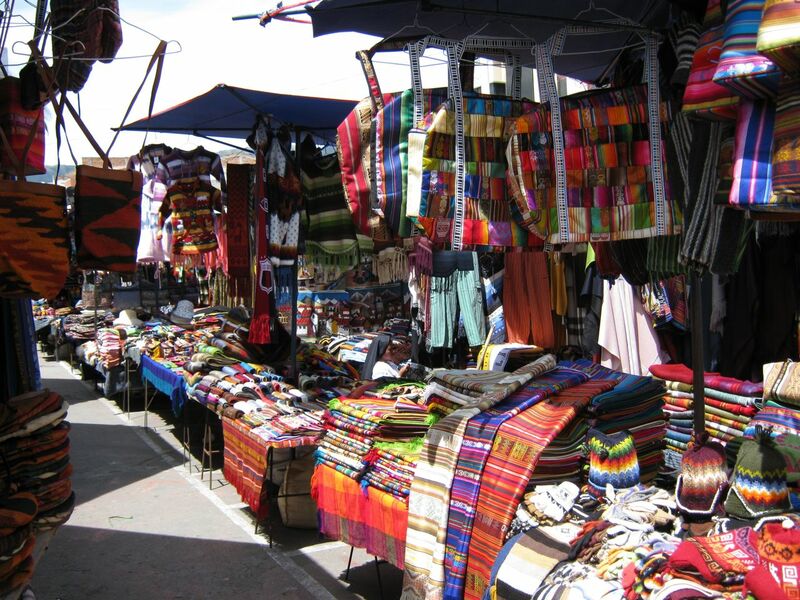 On the way home, we walked through Otavalo's world-famous handicrafts market, Plaza de Ponchos. Isabelle was not much of a shopper, but she did find a poncho she liked and purchased. She needed something warm for when she went to Cotopaxi province in a few days. We helped find a color that we thought looked good on her. It was very comfortable talking to Isabelle on our walk. She was very level-headed. I hadn't met many eighteen-year-olds like her, either here or in the United States. The afternoon was laid back. After café (the most common nightly meal) we played "Ticket to Ride". As always, Brayan won. Isabelle came in second, though. I must be too old for "Ticket to Ride". I probably can't process all the strategies and connections or something. The game board is a map of Germany, so Isabelle was able to show us where she lived and where she would be going to university in the fall. Marilyn and Isabelle took a taxi to the animal market. As Marilyn expected, Isabelle enjoyed it. She found a kitten she fell in love with but, of course, there was no way she could take it home. They did buy a watermelon, however. When they came home, Isabelle was cradling the watermelon in her arms and Marilyn told Isabel that Isabelle had bought a kitten. Isabel hates cats! You should have seen her face before she realized it was a joke. 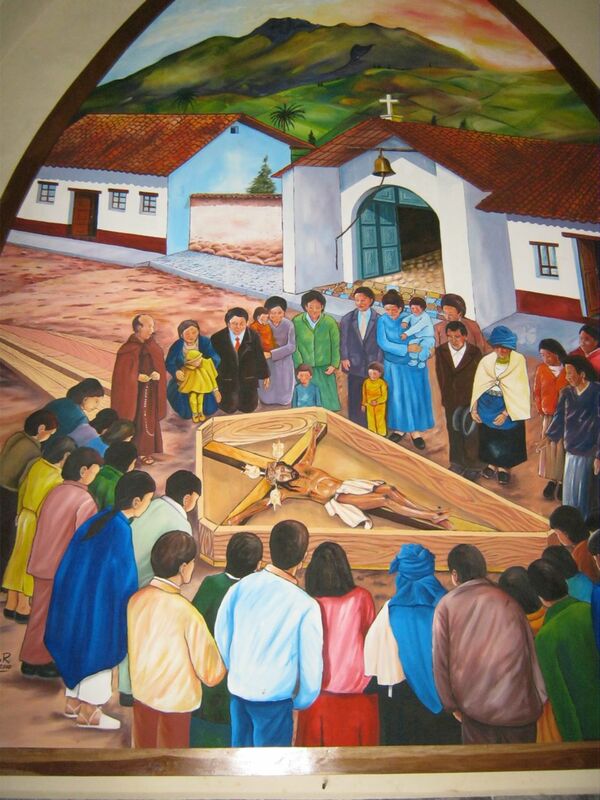 After a breakfast of pancakes, we all headed for San Antonio de Ibarra to show her the many things carved from wood. On the way, her mother called and we were surprised that we, especially Marilyn, could understand as many German words as we did. August 10th is Independence Day in Ecuador, so this was three-day holiday. 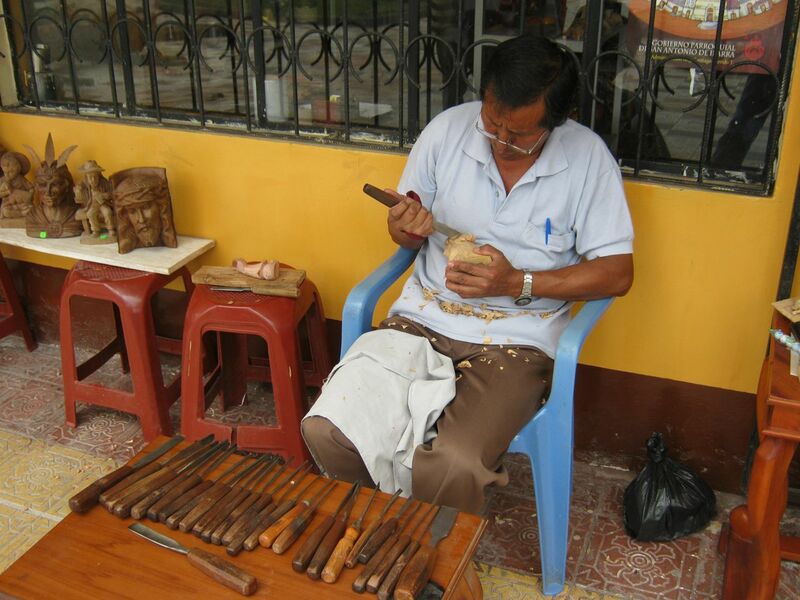 Consequently, San Antonio de Ibarra had wood carving demonstrations that they don't normally have, which was an added bonus for us. Next, we went to an archaeology museum in Ibarra. It was very nicely done and had explanations in Spanish and English. One could also rent guided tapes in Spanish, English, and German. Karen Stothert, an archaeologist friend of ours from San Antonio, Texas, had told us about this museum because she had helped put it together. Besides the museum itself, an interesting thing was that the guards took our cedulas (identification cards) upon entrance and gave them back when we left, I assume for security purposes. People need to have their cedulas with them, so that method appeared to be a pretty good deterrent to theft. Since Isabelle is here on a 90-day visitor visa, they didn't take anything of hers. We Love this Picnic Spot! We then had a picnic above Lago Yahuarcocha. The spot is one of our favorite views of the lake. However, the road getting there was all torn up because they were installing a sewer line. Billy Bob (our van) handled it, but we really should have had Molly, a four-wheel-drive car. There were very deep pits for the manholes and at places there was barely enough room to get between the manhole and the side of the mountain, or the manhole and the edge of the cliff! When we got to the end of the roadwork, we saw another road leading down and vowed to take it on the way back, no matter where it went. The view wasn't all that spectacular this time because it was overcast and there was a lot of dust in the air. But we had a good time anyhow. We had our picnic. However, we only had one sandwich each because Isabel hadn't realized that Marilyn had bought a lot more pan (bread). Thus, Isabel only brought six "buns". We wound up at Rosalie Suarez, of course. I broke with my tradition of ordering coconut and whatever, and ordered higo (fig) and guanabana (I don't know how to describe this fruit). Isabelle got to taste all the flavors we had ordered, besides her own. With two flavors per cup and six people, she got to taste most of the flavors available. On the way home, we started talking again about all of the pan Marilyn had bought and we hadn't used. Since Isabelle was leaving the next day, and we'd be hard-pressed to eat the bread before it got stale, I asked Isabel to invite Luz, Cesar, and Maria Augusta (their daughter) over for café. Besides, I wanted Isabelle to meet them. Until now, she had only seen them briefly at Punto y Coma. During café, Luz started talking about the "spark" she had seen in Christian's eyes when he had greeted Isabelle at the restaurant with a kiss on the cheek. She said she had seen it in Isabelle's eyes, too. I don't know about that, although Christian is a pretty handsome hombre. Before Isabelle could escape, Luz had dialed Christian's number and handed the phone to her. I laughed till I cried at Luz's antics, Isabelle's bright red flush, and Isabelle's attempts at making conversation on the telephone with someone she really didn't know. After that, Isabelle went upstairs to get ready for bed, having learned that what we said about our family being loca (crazy) was really true. 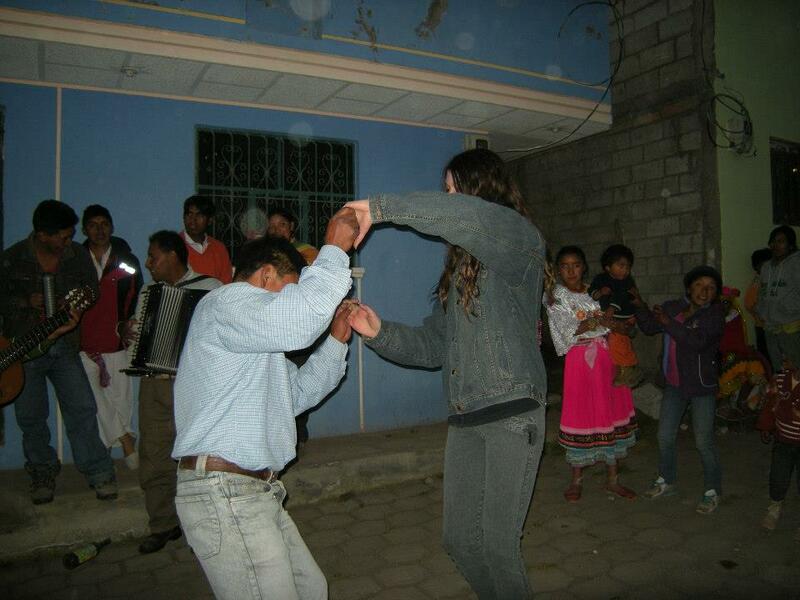 When Isabelle had first come, we had learned that she liked to dance, but we didn't know anything about Otavalo night life. Elvis, Isabel's 24-year-old son, wasn't here, either. I made the comment (though I knew at the time it was dangerous) that, "I bet Christian could show Isabelle where to go dancing." Sure enough, Luz was on the phone to Christian in no time asking him if he would take Isabelle dancing. He said yes (of course) and promised to come by in a few minutes to pick her up. Marilyn went upstairs and asked Isabelle if she wanted to go. It didn't take her long to say yes. Christian hadn't shown up by the time Luz and Cesar were ready to leave, so they walked her down to the Pan-Americana highway to meet him. We told them to give Christian our phone number, and that he was to have her back by midnight. For some reason, Cesar told them they could stay out until 1:00 or 1:30 am. Shortly after midnight, Isabel woke up wondering where they were. Again at 12:30 am. Again at 12:50 am. She decided to call Luz at 1:30 am if they hadn't shown up by then. At 1:00 am, Christian called saying they couldn't find the house. She directed them to the house and went back to bed after Isabelle arrived. Isabelle had had a fabulous time, and even met a boy from Germany. When she found out that Isabel was worried, however, she was very apologetic. It wasn't her fault, though. Cesar had neglected to tell us that he told them they could stay out later. We took Isabelle to church at Tocagón, as we were requested to do. After church, Marilyn made some tomato soup. Isabel helped a little, though Marilyn wanted her to just take the day off. Isabelle also helped when not telling her family and friends on Facebook about the night before. After lunch, Isabel, Marilyn and I walked to the bus station to see Isabelle off. Because it was a holiday weekend, she had to buy a ticket before getting on the bus. Normally, one pays the driver or an assistant when boarding the bus. A policeman spotted me in my wheelchair and thought I was going on the bus. So he told Isabel to go to the head of the ticket line, which wasn't too long, and by a ticket. Isabel didn't correct him, so Isabelle got to benefit of my disability. We got her on an uncrowded (as yet) bus and Isabel made sure she was comfortably situated. On the walk home, we talked about how impressed we had been with Isabelle. For an 18-year-old, she was amazingly mature, intelligent, pretty, and personable. We hoped she would have time for a return visit before going back to Germany. In fact, Marilyn emailed Blanca and told her just that. Isabelle Tyrasa came back today. She arrived at the bus station at noon. She had been in the province of Cotopaxi, south of Quito for two weeks learning about the projects FEDICE sponsors and learning about the culture and lifestyles of indigenous people. The first two days in Cotopaxi, she stayed with the family of Marco Garzón, an employee of FEDICE who is an expert in animal husbandry and agriculture. After that, Isabelle moved from one rural family to another each day for six days. It was a chance to get close to the people, really learn, and build lasting friendships. She learned to milk a cow, as well as many other things. And, of course, there was time to have fun at the fiestas. The last week in Cotopaxi was spent with Marco and his family again, visiting the animals and kindergartens of other comunidades and enjoying some tourism in Baños and Puyo, which are east of the Andes in Ecuador, in the Oriente. When Isabelle was in Cotopaxi, she missed us. 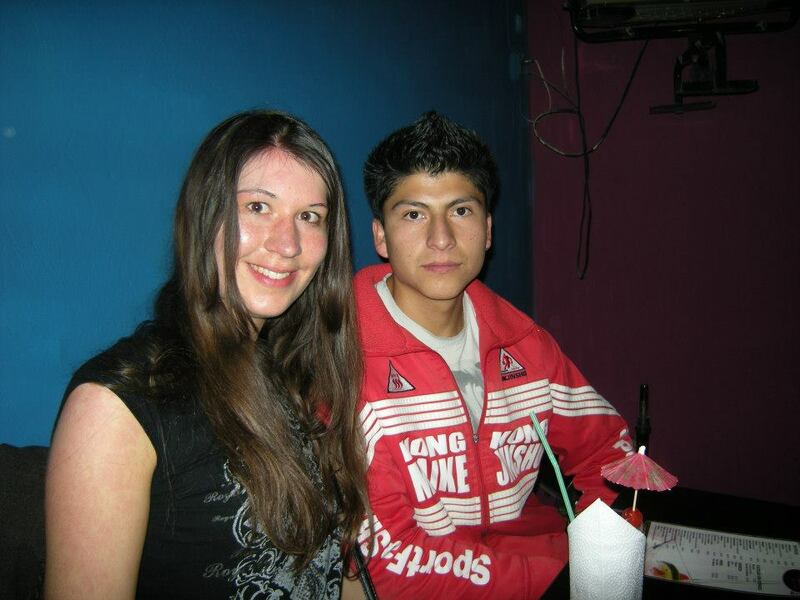 Now that she was back, she missed the friends she had made in Cotopaxi. 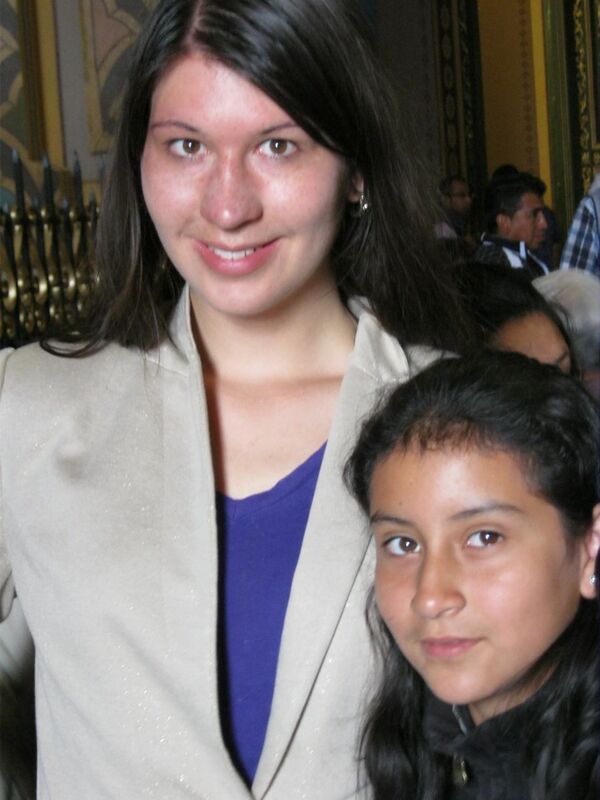 No doubt, Ecuador and its people will always warm a corner of Isabelle's heart. After lunch, Marilyn and Brayan took her to Laguna Mojanda, where Marilyn wanted to hike to the third laguna. They made it to the second laguna, but ran out of time before they could reach the third. Isabel didn't go with them because she wasn't feeling very well. We thought Isabelle would enjoy a couple of different experiences, so we took her to mass at El Quinche and the Quito zoo at Guayllabamba. Because of a late start, we got to El Quinche about 10:30 am and had to wait for the 11:00 am mass. Later, Isabelle said that she didn't think any church in Germany had so many people in it. Indeed, there were a lot of people - Isabel said more than normal - and it was not any kind of holiday or feast day. The church was beautiful inside, which is why we took her there. After mass, we took Isabelle to a treasure we discovered (that our Ecuadorian family already knew about) on the day we had Billy Bob blessed. In front of the church, there's a restaurant that serves fresh empanadas with powdered sugar on them. In Ecuador, they're the closest thing I've had to beignets. I didn't think they were as good as last time, but that may have been because I had the ones filled with queso (cheese). Last time, I must have had the marocho (a type of corn). Isabelle said that she was not big on cheese, but she really liked these. At the zoo, we had a picnic in the parking lot before going in. But we were on the edge of the parking lot, so we had a view of something besides cars. It reminded Marilyn and me of doing the same thing with Marilyn's aunt Esther at Mt. Hood in Oregon. That time, the lot was packed with cars behind us, but we had a great view looking down the mountain. The zoo was good, too. Isabelle enjoyed it a lot. Marilyn, Isabel, Brayan, and Victoria had gone some time back. 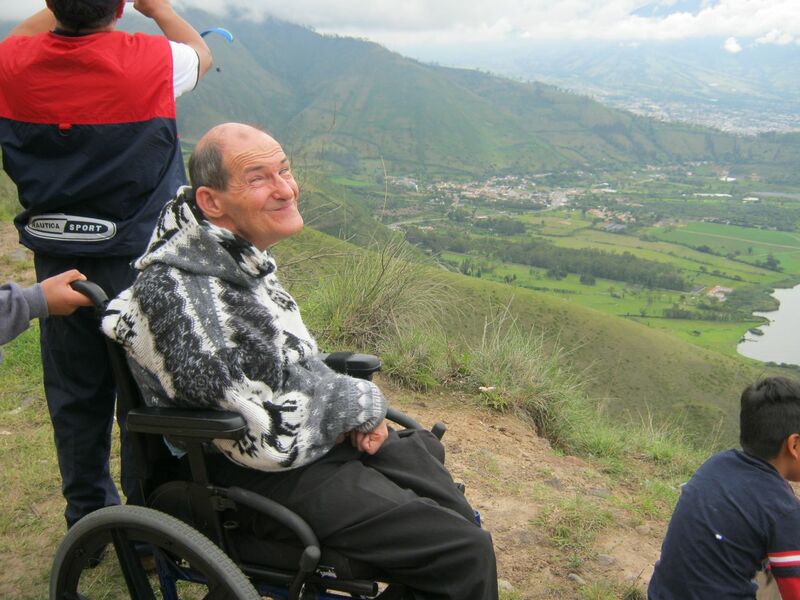 I had opted to stay home because I remembered it being inaccessible when we went with our friends Mary and George on a tour of Ecuador in 2004. Now it's fully accessible. In 2004, Marilyn told me that most of the animals were in smallish cages. Now, most have habitat areas. 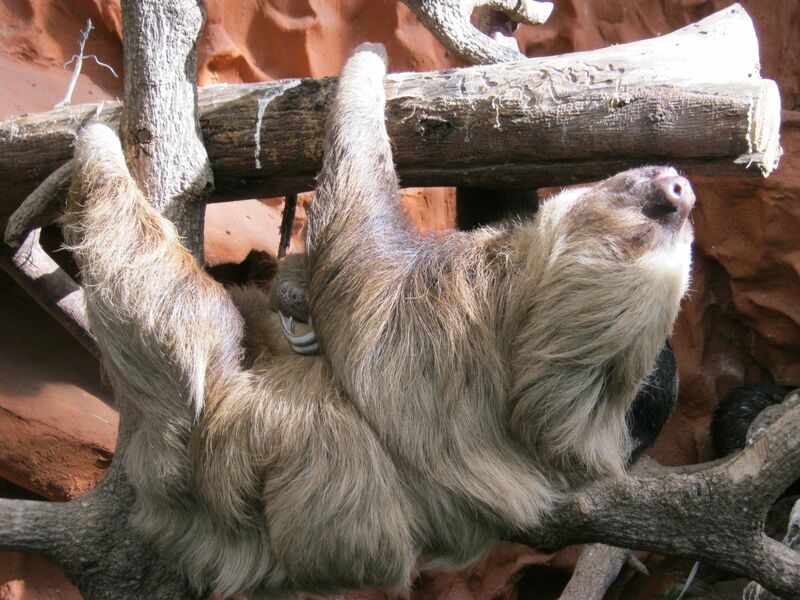 My favorite animal was the sloth. And I absolutely love the name they use here - Oso Perezoso (lazy bear). Finally, we took Isabelle to where she was staying in Quito. I didn't get out of the car, but Marilyn said Isabelle almost had tears in her eyes when she was saying goodbye to everyone. I didn't notice it when she gave me a hug and farewell kiss on the cheek, but Marilyn tells me I'm not that observant. The trip back to Otavalo was fairly quiet, even though there were eight of us. Part of the reason was that we were tired and part of the reason was that I believe most of us were thinking about Isabelle. I know I was. Isabelle is a good, bright, attractive young woman with a heart for her fellow human beings. (Did I say that already?) We all wish her the best. She will return to Germany on September 2nd and begin university classes in October. But Isabelle has already said that she intends to return to Ecuador, maybe as early as February or March of 2013. We'll definitely keep the light on for her.